Things to look for - instructions from the owner, an insurance policy, or an inventory list. These items would definitely help in determining the worth of the collection. GET SOME HELP - Stamp Dealers/Local Stamp Shows/Local Clubs Can Help - Another method of determining the value would be to simply take the stamps to a dealer and ask them what they would pay (you may want to clarify to the dealer that you are not requesting an official appraisal - see appraisals below for more information). Feel free to use our online APS Dealers Directory. NOTE: if you ask a dealer to come to your home to review the collection, the dealer may expect to be paid - be sure to discuss this in advance and agree upon an amount. Many individuals with little knowledge about postage stamps worry that they will not be offered a fair price. The vast majority of dealers are trustworthy but it is a good idea to verify that a dealer is a member of the American Philatelic Society (all dealers listed on the above mentioned dealer directory are APS members), the American Stamp Dealers Association or the National Stamp Dealers Association as these organizations have established codes of ethics. If you are still concerned about receiving a fair price for your stamps you might consider visiting a local stamp show (see our Show Calendar). This would provide you with the opportunity to offer the material to several dealers and compare how much they will pay. You also may wish to contact a local stamp club, where you might find help. APS Estate Advice - If the individual who owned the collection was an APS member who passed away within the past year, the APS will try to find someone who could come and view the collection and provide advice. 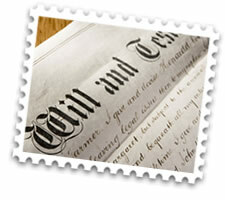 You may contact the APS Estate Advice Service by clicking here or calling (814)933-3803. Please remember that this service is for heirs of APS members only! Keep it - First, you could keep the collection for yourself. If this is of interest we encourage you to become a member of the APS. You can find out more about the APS and join online. We offer all sorts of help for beginners. Donate It - Many organizations gladly accept donations and some such as the APS are IRS approved non-profit organizations so that you may claim a tax deduction. Visit our donation pages, for more details. APS Member Services Available for Selling - Lower end material is most often sold as one unit although many American Philatelic Society members use our Circuit Sales Division. Mounting stamps in our sales books requires APS membership (we invite you to join), some philatelic knowledge, is very time intensive and payment is usually not received for 18 months, but the realizations may be much greater. The newest method of selling is over the Internet. Ebay and several competitors offer on line auctions. This requires a computer, scanner, and Internet access. It offers quick turnaround and is best for mid-priced items. The APS also offers net price sales over the Internet which does not require any computer equipment. Additional information on this service is available at www.stampstore.org.